Inside the cell, DNA is tightly wrapped around proteins and packed in a complex, 3D structure that we call “chromatin”. Chromatin not only protects our genetic material from damage, but also organizes the entire genome by regulating the expression of genes in three dimensions, unwinding them to be presented to the cell’s gene-expression machinery and then winding them back in. Inside the 3D chromatin structure there are certain regions called “topologically associating domains” or TADs. These contain DNA sequences (thousands to millions of DNA bases) that physically interact with each other, suggesting that the genes in these domains may be working together. Discovered in 2012, the functions of TADs are not yet fully understood, but it is known that disrupting TADs disrupts gene regulation, and this can be a mechanism that cancer cells use to alter gene expression. Now, scientists led by Elisa Oricchio at EPFL, in collaboration with Giovanni Ciriello at UNIL, have discovered that a mutation of a particular gene leads to modifying interactions within TADs. The gene is called EZH2 and is normally involved in the repression of gene transcription – the first step in gene expression. In fact, EZH2 mutations play key roles in the initiation of tumors and can be used as marker for diagnosing several different types of cancers. The scientists studied what is known as a gain-of-function mutation of EZH2. 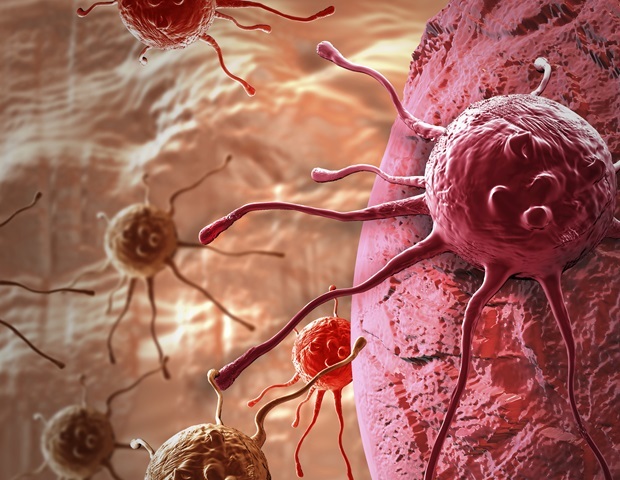 These types of mutations exacerbate the gene’s function and help tumor cells to grow. Here, the researchers found that EZH2 does not act randomly across the genome but rather preferentially within specific TADs. Mutated EZH2 shuts down entire domains, turning off genes that normally suppress tumors. In their study, the loss of multiple genes synergistically accelerated the development of the tumors. And when the researchers inhibited mutated EZH2 with a drug, all the functions were restored. The study is the first to show that mutated EZH2 affects not individual genes but entire chromatin domains, changing the interactions and expression of tumor-suppressive genes contained in those domains. This article was originally published by News-medical.net. Read the original article here.